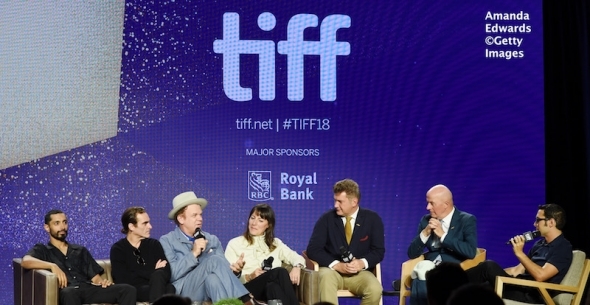 Speaking at the press conference for the film, ‘The Sisters Brothers’, at the Toronto International Film Festival on Saturday (September 8), he said he got to warm to his character, ‘Hermann Kermit Warm’. When acv asked him the question about being in a Western, he paused distinctly and answered bluntly: ‘No’, to ripples of laughter around the room. In the film, Ahmed plays a chemist who has devised a method of identifying gold from rivers. Set in the 1860s and the Californian gold rush, the Sisters (that is the pair’s surnames and they are) brothers as played by John C Reilly and Joaquin Phoenix and are chasing Warm on behalf of client of theirs. When we asked Ahmed about the character and how well he related to him, he told acv and the assembled journalists: “I have to say, I just loved this character, man. He is someone who is trying to make the world a better place and he is such an optimist, and I think sometimes I can be a bit of a cynic – or just be a bit skeptical from a British perspective. “I didn’t really relate to him that much going into it, but by the end, I felt like he has a nice way of looking at the world, instead of seeing everything as broken – he’s looking at all the opportunities there are to fix things. His character, Warm, talks about communes or “Communism before Communism” as Ahmed referred to earlier in the press conference, talking briefly about how there were idealists and people wanting to create a new type of society in the US at that time. The film is directed by Jacques Audiard who has a formidable roll of credits and plaudits – and this represents his first English language film. Audiard actually talked to acv about this in 2016. See the interview towards the end Youtube channel. Ahmed also talked about teaming up with Jake Gyllenhaal again – the two made for a memorable pair in ‘Nightcrawler’ and again are something of a double act. But Audiard said he discovered Ahmed in ‘The Night of’, the US TV series for which Ahmed won an Emmy. Audiard told us he did not cast him because of the ‘Nightcrawler’ – he has not seen it. Ahmed said there was a familiarity with Gyllenhaal. While the movie is a traditional Western in one sense, as you would expect of a Palme d’Or winner at Cannes, the director behind ‘A Prophet’ and ‘Rust and Bone’, plays with the genre in another. Reilly and Phoenix play two brothers who are of very different temperament and are often in conflict. They are also also well-read, educated and smarter then they look and it makes for all the difference in a film that isn’t wholly predictable (like many Westerns). ‘The Sisters Brothers’ has unexpected humour and is in some ways essentially about two sets of buddies – who do not always see eye to eye or whose original relationship starts quite differently. The Sisters Brothers – Reilly and Phoenix – and Gyllenhaal and Ahmed, all have their differences and individual foibles and traits and yet when they come together or don’t, there’s a lovely energy. Entertaining and witty with a stimulating intellectual veneer, it’s not a film acv would normally be be drawn to – but for Ahmed’s presence and Audiard’s distinction as a director; and it actually offers much because of the strength of the acting and the directing. Adapted from a famous novel from these parts, written by Patrick deWitt, it’s something you should enjoy, Western fan or not – because it is a notch above the common Western film.